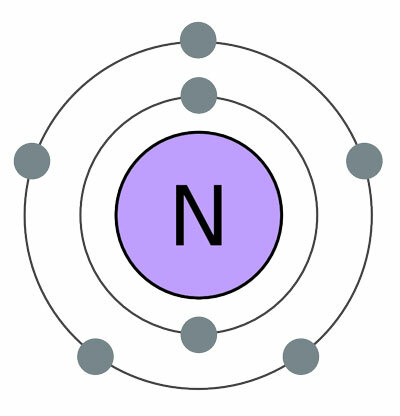 Nitrogen is a gas with 7 protons and 7 neutrons in its nucleus. It is the major building block of our atmosphere. 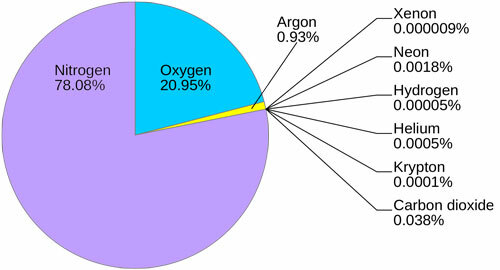 Our atmosphere is the mixture 21% oxygen, 78.1% Nitrogen, and 0.9% other gases. Nitrogen is also an essential element for the life, it available in every living thing including humans. Our DNA also contains nitrogen atoms. Nitrogen is a colorless and odorless gas. It is non-metal diatomic gas with an electronegativity of 3.0. It is almost inert gas in nature. However, it can react with other elements if the conditions are right. The majority of the nitrogen is used to make ammonia. It is used to produce nitrogen fertilizer and nitric acid. It is used to provide the inert atmosphere for some electrical circuits, experimental environment, and explosive liquid tanks. It is also used in the liquid state to super cool the things. Nitrogen is a gas that is freely and abundantly available in the atmosphere. Our atmosphere is composed of about 78.1% Nitrogen. Industries use fractional distillation method to separate the nitrogen from oxygen, water vapors, and other gases. There are many compounds of nitrogen found on the earth from which we can extract nitrogen, but getting nitrogen from air is easy. Daniel Rutherford in 1772 was performing an experiment on the air. In that experiments, he found that there was a gas other than oxygen in the air that didn’t support the burning. He named that gas “noxious gas”. Nitrogen got its official name in 1790. Titan is the moon of planet Saturn whose atmosphere is made of about 98% Nitrogen. Nitrous oxide, also known as laughing gas is made with nitrogen. It is used by dentists for some dental procedures. It is called laughing gas because it makes some people laugh. Nitrogen is used in the manufacturing of dynamite (an explosive). Nitrogen is the 7th most abundant element in the universe. The human body contains about 3% Nitrogen. Abdul Wahab, "Nitrogen," in Science4Fun, April 13, 2019, http://science4fun.info/nitrogen/.